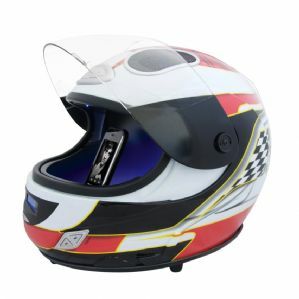 This full size replica F1 Racing Helmet iPod Sound System has a motorized visor that automatically lifts to reveal the universal iPod or iPhone Dock. It accepts most Apple 1 MP3 products and has a USB Port to work as Computer speakers plus SD Card Slot for MP3 Playback. The stereo speakers are on the top of the helmet with the Super Sub in the base. This great piece of kit also has FM Auto Scan Radio, a 3.5mm dia Aux-in Jack, LCD Display and Full Remote Control. 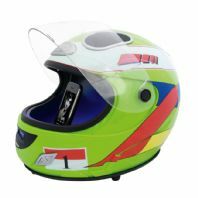 Available in either the F1 Helmet (Red) or the Moto GP (Green). Condition of Sale. This item is guaranteed by the manufacturer. It is the manufacturers responsibility to replace or repair. You must return the product to the manufacturer in its original packaging in any event.